If you've read The Mischievous Mrs. Maxfield, you know who Brandon Maxfield is. He's only my readers' favorite book-husband ever. *wink* If you've read his little journal note about the honeymoon and swooned, then you might like this. We've been in Charlotte's head throughout the whole epic ride of her life, glimpsing the mind and heart of the prince who swept this not-so-proper princess off her feet. 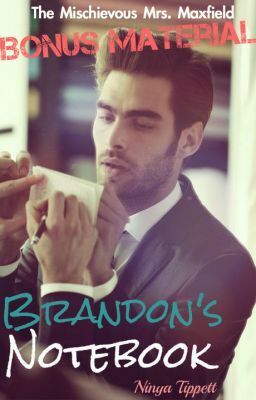 If you want to see more of what went through Brandon's mind, read on. See what it's like from this side of the fairy tale... ***PLEASE DO NOT READ THIS IF YOU HAVE NOT FINISHED The Mischievous Mrs. Maxfield. *** Author's Note: These are not duplicates of scenes that have been depicted in The Mischievous Mrs. Maxfield told from Brandon's POV. This book is going to consist of Brandon's journal entries as he goes through the similar experiences as Charlotte so it's not going to read like actual scenes in a book. Fan it at: https://www.facebook.com/TheMischievousMrsMaxfield *** Copyright © 2014 by Nina Tippett. All rights reserved. No part of this document may be reproduced or transmitted in any form or by any means, electronic, mechanical, photocopying, recording, or otherwise, without prior written permission of Nina Tippett. This is a work of fiction. All of the characters, organizations, and events portrayed in this novel are either products of the author's imagination or are used fictitiously. Images, music and videos used in the cover art and any of the multimedia content posted in this story are the sole property of their respective owners.